Does the location of the apparition ever have significance or is Our Lady just there because of the visionaries ‘being’ there? 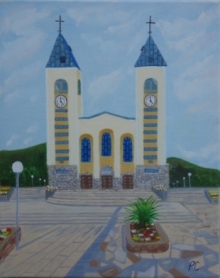 Our Lady's message in Medjugorje supports her role in the Church, and coincidentally is virtually the same message proclaimed by John the Baptist. Just as John's message, Our Lady points the way to her Son Jesus, and implores us to "repent", to change our lives to lives with God as our focus and core. It is interesting that Our Lady's first appearance in Medjugorje was on June 24, 1981, the feast of John the Baptist.